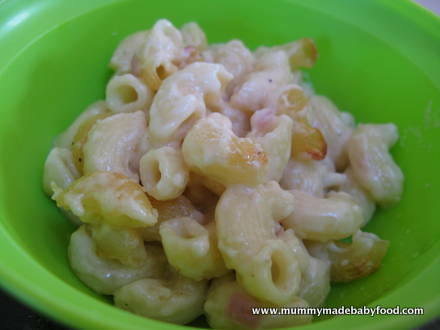 Here is a quick pasta recipe your baby is sure to love, pairing the key ingredients of cheese and pasta. 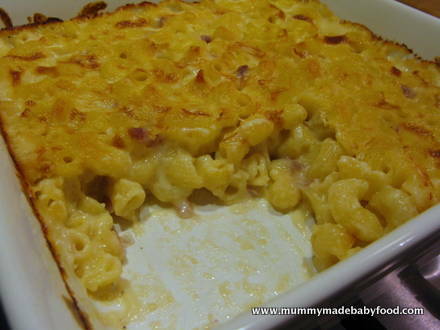 One of the all time favourites, and perhaps the ultimate comfort food, this Baked Macaroni and Cheese is so simple to make, yet so delicious and filling. Little tummies will love it! Whilst traditional macaroni and cheese is baked in the oven, there are stovetop variations, as well, which lead to creamier textures. 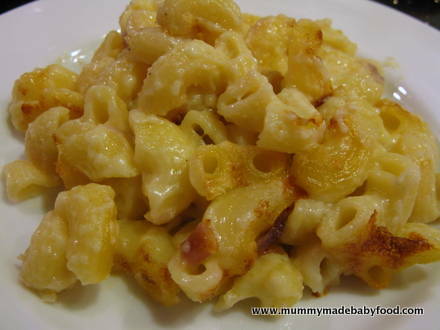 Macaroni and cheese has its origins in a French dish called makerouns, a quick pasta dish combining cheese and pasta in a casserole, recorded in a medieval French cookbook, written in the 14th century. Who knew it would still be so popular today? Both of my boys love their pasta, so I was looking for extra pasta dishes to work into their menu rotation, and this recipe seemed ideal. 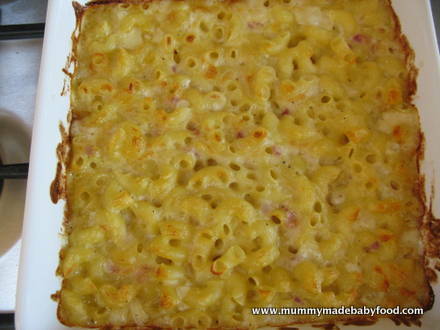 It instantly takes me back to my own childhood and growing up eating mac 'n' cheese - nothing beats the taste of the crispy top layer that has been browned in the oven. This recipe yields approximately 6-8 servings. Preheat oven to 175C / 155C Fan. Melt the butter in a saucepan over medium heat. 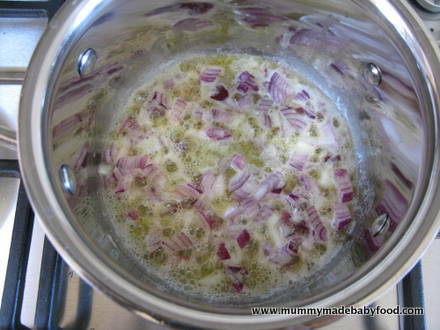 Add the onions, and cook for approximately 2 minutes, or until they are soft. Add the flour, and cook for 1 minute, stirring continuously. Stir in the milk, a little at a time until it is all gone, and then add the black pepper (if using). 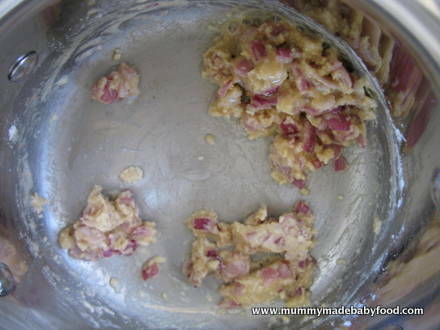 Bring the mixture to a gentle boil, and cook until it thickens, stirring frequently. Meanwhile, cook the pasta according to the instructions on the packet. Drain and set aside when ready. 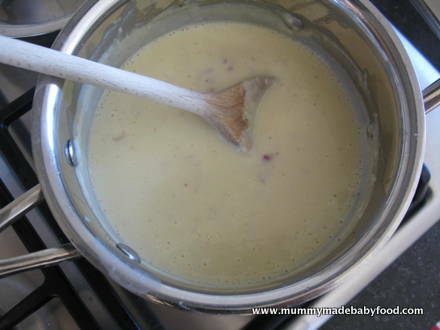 When the milk mixture has thickened, add the grated cheese until it is fully melted and incorporated, then turn off the heat. 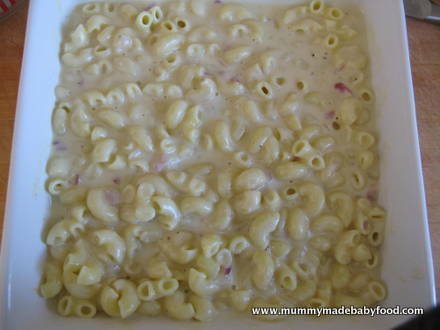 Combine the pasta and cheese sauce in an oven-proof baking dish, mixing well. Bake for 30 minutes until the top is slightly browned and the sauce is bubbly.